Most dive books (Godfrey, Harwood & Bryning, Lonely Planet) try to cover a range of atolls. While this breadth approach is useful when trying to plan your next resort destination, it’s less useful when you’ve actually decided on your base where you are likely to stay mostly within your atoll. 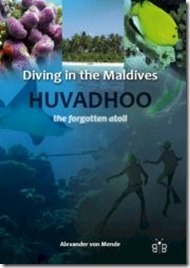 And increasingly, if you are a keen diver, that atoll is likely to be “Huvadhoo (Gaafu Alifu and Gaafu Dhallu). Alexander von Mende’s book, “Diving in the Maldives – Huvadhoo, the forgotten atoll” is the ideal one for diver planning a trip to this unsung gem. He takes a different tack by focusing entirely on this one location in depth. Huvadhoo is one of the furtherst atolls from the Male hub which may have served as a deterrent. But that unspoiled nature is now becoming one of its top allures. Von Mende also claims that it is one of the best locations for spotting large marine life like Silver Tip and Grey Reef Sharks, Dolphins, but especially Whale Sharks. South Ari has long been renowned as the pre-eminent diving atoll especially with its quite prominent whale shark marine protected area. But the more visitors get to know Huvadhoo, it could rival South Ari for that crown. I know that when we dove and snorkelled Huvadhoo, it was some of the most impressive we had done in our years of Maldive visits. An open-water close encounter with a juvenile dolphin was one of the lifetime high points of diving for us. And we spotted dolphins every single time we got into a boat at Huvadhoo even for a simple, short transfer. Von Mende’s book is also sort of an all purpose diving (and even snorkelling) book for anyone visiting the Huvadhoo atoll. It features in depth description 34 dive sites with dive chart illustrations for half. It also has 136 pages of “Identification Guide” provide pictures and other information on the fish, coral and other marine life found in that area.